Are you looking for an 8x8 shed? At Ace Sheds we design and manufacture bespoke 8x8 garden sheds built to complement even the most comprising of gardens. Whether it be a storage solution, home gym, garden office or children’s playhouse, we urge you to make the most out of your quality garden building. We have over 30 years of experience in designing, manufacturing and delivering garden sheds across the South East. During this time we have continued to bespoke our service offering and increase the standards of our buildings. Using locally sourced timber and pressure treatment, each of timber sheds is built for optimum durability and longevity. Our pressure treated wood preservative ensures your builds are protected from rot and decay, maintaining the attractiveness and quality of our 8x8 wood sheds. Our garden sheds are designed to be multipurpose. By adding a window to your building you can allow the light to flood in and the space to grow, or by utilising a double door opening you increase the accessibility to your garden building, letting the outside in. Because our sheds can be used for a number of purposes, we offer a number of optional extras and security features to enhance the functionality of your shed. 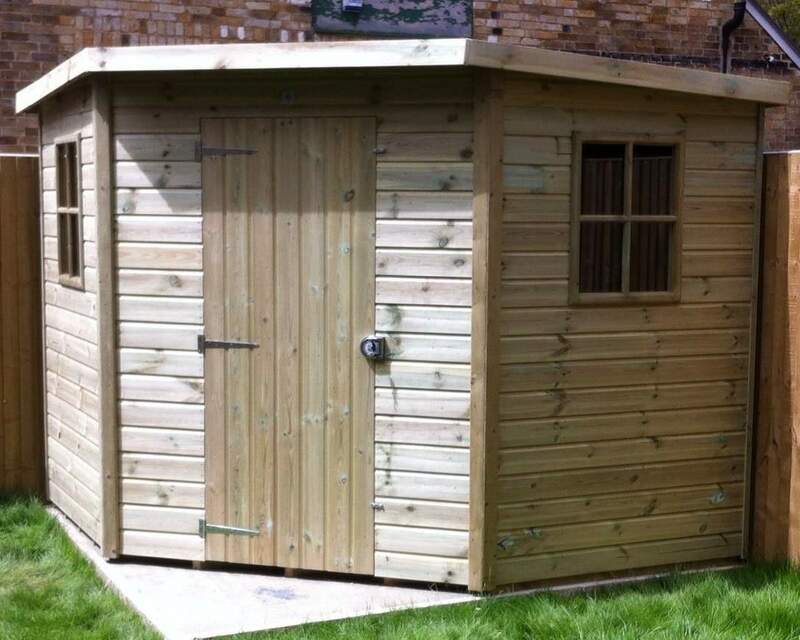 If your 8x8 garden shed is for storing valuables it might be worth investing in a security padlock or mesh, or, if your shed is designed for garden office, you might want to increase the thickness of cladding and quality of felt to improve the protection of your shed. A team of experienced and professional craftsmen work tirelessly behind the scenes to ensure your timber buildings are up to the highest standards. All of the manufacturing happens right on site, here in the heart of Kent, allowing us to conduct quality checks every step of the way. With the utmost care and attention to detail, our craftsmen take pride in each of their builds. 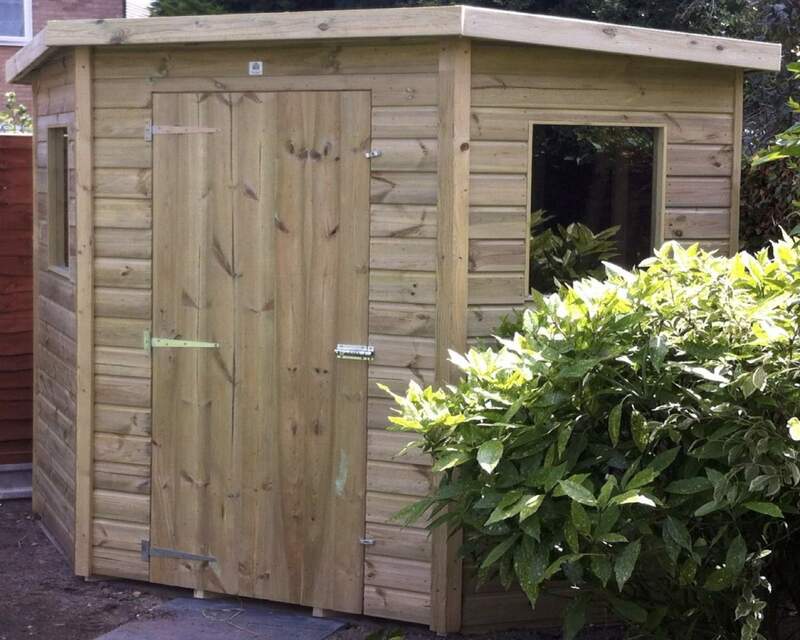 You can rest assured you garden building will be handled with care from the moment you place your order, to the moment your shed is delivered and installed. What’s more, each of sheds is completely customisable. Our simple 11-step customisation process means you can bespoke your 8x8 wooden shed to your preferences. Whether it be changing the positioning of the doors and windows, or opting for a double opening window, to increasing cladding thickness and the quality felt, you can make subtle changes to ensure your shed is functional for you. Even better, if you’re unable to find a shed to your preferences, we offer a bespoke service too, which means you can design a shed from scratch working closely with our team. If that’s what you’re looking for, simply get in touch today! A quality shed can be an expensive investment, as can the delivery and installation costs too. We have tried to reduce these fees by offering free delivery to everyone in the South East and free installation with every purchase. To check if you’re eligible for free delivery, head over to our delivery page and enter your postcode. What’s more, if you want to take on the installation of your garden shed, that’s not a problem. We’ll be happy to deliver your garden shed and leave the rest to you – simply make your choice at the checkout! If you would like further information about our products or services please get in contact today. Our showroom is open 5 days a week during the winter or 6 days a week during the summer, so you can pop in and see our sheds in action!